Map of southern Italy with beautifully rendered Mt. Etna. Partie Meridionale du Royaume de Naples, ou se trouvent la Calabre et l'Isle et Royaume de Sicile. 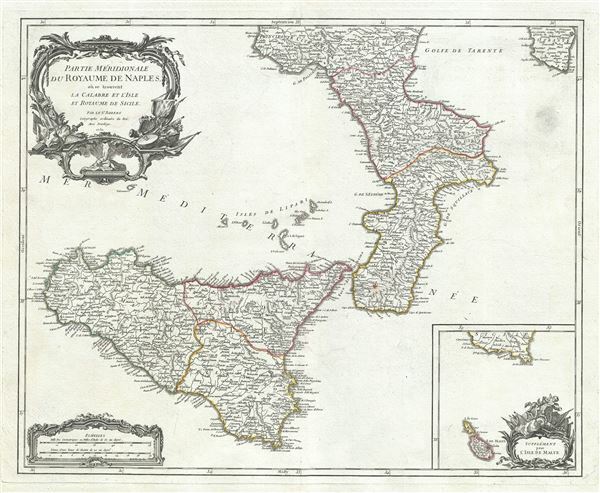 This is an attractive 1750 map of southern Italy by Robert de Vaugondy. It covers the southern regions of the territories claimed by the Kingdom of Naples and extends from Agropoli south to include the island of Sicily. An inset in the bottom right quadrant features the Isle of Malta. Mt. Etna, the tallest active volcano in the region, is beautifully rendered. Sicily became a Greek colony around 750 BC and according to Greek mythology, the monster Typhon, is trapped under Mount Etna. Several important towns, cities, roads, rivers, lakes and other topographical features are noted throughout. A beautifully illustrated title cartouche adorns the top left quadrant of the map as well as the bottom right quadrant of the inset. This map was drawn by Robert de Vaugondy in 1750 and published in the 1757 issue of his Atlas Universal. The Atlas Universal was one of the first atlases based upon actual surveys. Therefore, this map is highly accurate (for the period) and has most contemporary town names correct. Very good. Some wear and toning along original centerfold. Original platemark visible. Some spotting and offsetting with damp stain near margins. Rumsey 3353.086. Pedley, Mary Sponberg Belle et Utile: The Work of the Robert de Vaugondy Family of Mapmakers, 362.